Joe Weems is an illustrator and Harvey award-nominated inker of some repute (probably ill amongst his editors). For more than 20 years he has been inking comic books and has worked for pretty much every major publisher. 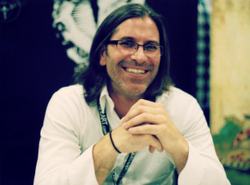 Marc Silvestri, Michael Turner, David Finch, Joe Benitez, Brandon Peterson, Dale Keown and Whilce Portacio are just a few of the amazing artists he's had the honor of collaborating with over the years. In 2000-2005 Joe was employed by the Skateboard company Darkstar and drew all of their illustrated decks, wheels and miscellaneous merchandise. His slick and sharp approach to the art form can be seen on such titles as Aphrodite IX, Arcanum, the Darkness, Fathom, Hulk:the End, Hunter/Killer,The Magdalena, New X-Men, Vengeance of Vampirella, Weapon Zero, Wraithborn and more! Currently he is the monthly inker on World's Finest for DC Comics.